Tonight I am going to share some tags I made this year. My sweet friend Susan went the extra mile working with me on a project so I decided I needed to give her a little gift. 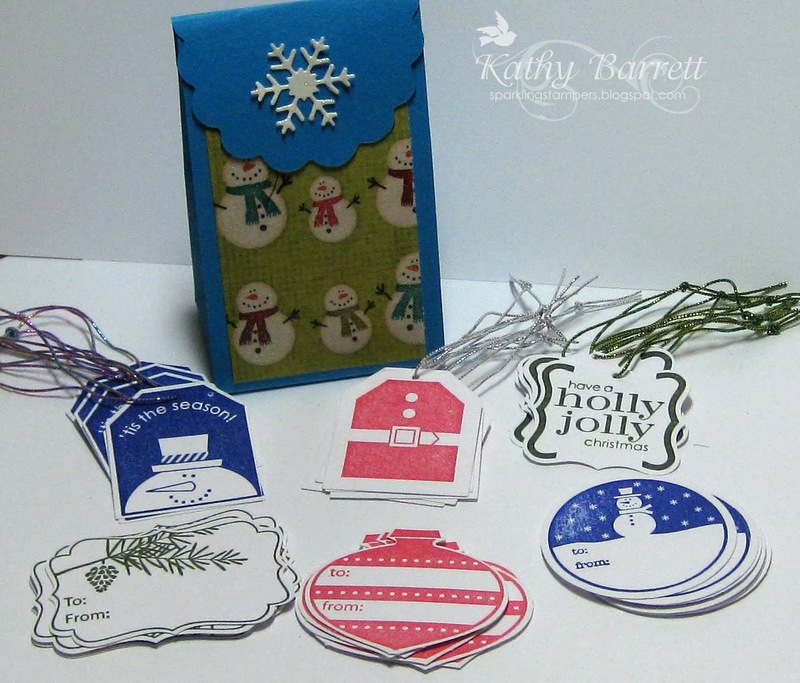 She has lots of family to whom she gives presents, so I made her a ton of gift tags! I also made a little sack to put them in using a Sizzix die. The tags use various SU! stamp sets. I used a scrap of dp and cd for the sack, and tied ribbon to half the tags (the ones with the to/from stamped on the backside) and put double sided tape on the back of the others. I used Versafine Satin Red, Majestic Blue, and Olympia Green ink and thin colored elastic for the ties. The snowflake is a die from MFT using DCWV glitter paper. I used SU! punches to cut everything out. Easy peasy! This is such a cool idea for a gift! I loved the tags you put on our Christmas gifts…what a delightful gift! These tags are great and am sure your friend loved them as did all her family when they got their gifts, i know i would. A wonderful set of tags! Thanks for joining us at HOA challenge!